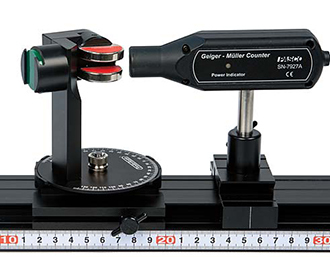 Demonstrate the deflection of beta particles in a magnetic field. The apparatus consists of a pair of permanent magnets with a radioactive source holder. The beta particles are deflected as they pass through the magnetic field. The entire source-and-magnet assembly can be rotated so the deflected beta particles will enter the fixed GM tube. 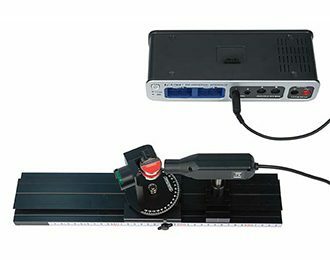 The GM tube can be connected directly to a 550 or 850 Universal Interface (UI-5001 or UI-5000) and the counts can be recorded in PASCO Capstone. Alternatively, the GM tube can be connected to a stand-alone Geiger Counter.